Chicago, like any big city, has its share of traffic issues and it can sometimes be very frustrating traveling through the city by car. Not to mention the scarcity of street parking and the ever increasing costs of parking garages if you're staying at a downtown hotel, and Chicago public transportation starts to look like an excellent choice for getting around. Fortunately, Chicago trains and buses are a great way to get you where you need to go. Follow this guide, and you'll be zipping around the city in no time. 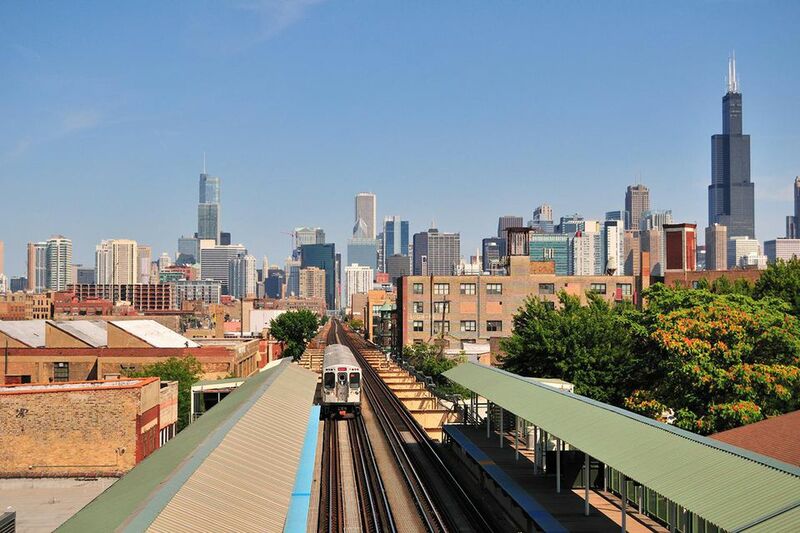 The Chicago Transit Authority (CTA) runs a network of trains and buses that service nearly every corner of the city. The trains fall under two categories: subway and elevated trains (the "L"). A quick look at a map of the Chicago train system, and you can see that it spiders out from downtown and is your best bet for getting to most of your Chicago destinations. The CTA buses fill in the gaps, running on a regular schedule on most major city streets. Visit the CTA's official website for more visitor information about Chicago's train and bus system, group sales and top transit trips. Reduced Fares: Military personnel in full uniform ride free; senior citizens 65 and older, plus children 7-11 pay a reduced fare ​of $1.10 bus, $1.25 train. Children under 7 are free. Transit card: A transit card can be loaded with any amount from $2 up to $100. Transit cards are required to ride CTA trains and are available from vending machines located at all train stations. Visitor passes: Passes offer unlimited rides in a specific period and are available at select locations. Bus fare boxes accept the transit card as well as cash. Neither the transit card vending machines or bus fare boxes give change, so make sure to have small bills handy when taking Chicago public transportation. The Chicago Transit Authority also has options for those staying in Chicago on extended visits. All of the passes and transit cards are also available online. While the CTA has somewhat of a confusing fare system, it is still infinitely more manageable than trying to find a parking spot along Michigan Avenue. The CTA offers a complete system map online, in both HTML and PDF formats. The colored lines indicate a train or subway and are generally referred to as their stated color (Red Line, Blue Line, etc.). Bus numbers are indicated in the ovals along the routes. The CTA is always attempting to streamline their operation, so train and bus intervals can vary depending on the time of day and route, especially overnight. Both bus schedules and train schedules are available online. A general rule of thumb: If you don't have a schedule handy, during normal working hours downtown trains arrive every few minutes, buses every 10 minutes. Holiday Inn Express Chicago-Midway Airport: Perfect for those on a budget, this family-friendly hotel is a brief walk to the Orange Line train, which is about a 30-minute ride to downtown Chicago. Once downtown, explore such attractions as the Art Institute, Museum Campus or Millennium Park. There are also plenty of child-friendly restaurants to visit. The hotel also offers complimentary continental breakfast, wifi and shuttle service to and from the airport. Hyatt Place Chicago Midway Airport: There's a free shuttle to and from the airport, plus additional perks for the business traveler such as a conference room, gym/pool, Starbucks and free wifi. It's also nearby the Orange Line. Loews Chicago O'Hare Hotel: The luxury hotel is fairly close to the Blue Line Rosemont station, which is one stop away from the O'Hare Airport stop. The hotel's shuttle takes guests to the train station, and Capital Grille and McCormick & Schmick's are on premises. The hotel caters to the business traveler, but it's also very family friendly. Renaissance Chicago O'Hare Suites Hotel: The business-oriented hotel is located approximately two minutes away from the Blue Line station by foot when the guests get off at the Cumberland stop (that's two stops from O'Hare). There's also a Starbucks store, fitness center, and pool. The Blue Line is 30 to 40 minutes from downtown.